There was a time when some humans developed the notion that all humans are created equal and that it is unjust for some to amass huge amounts of wealth while others grind their butts out. This notion gave birth to the idea of communism. However, the communists forgot that the trees in a nearby forest are not all of equal height and that many humans are inherently lazy. Sans incentives and the need to grind their butts out, many humans would rather sit and fatten that area of their anatomy. The result was that bread lines became longer and longer until they became longer than the communist manifesto. It was therefore soon discarded into the trash can. 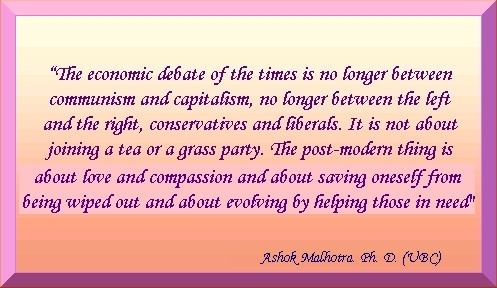 Some political parties still call themselves communist but that is simply out of nostalgia. They neither mean it nor live by the philosophy any longer. Capitalism thus marched across the world gloriously with the fond notion that if some individuals are allowed to grow exceptionally rich, it is good for business, and prosperity for all would trickle down, bit by bit, as water does from a leaky jug. This gave birth to the notion of trickle down capitalism. But, alas, humans, those blinded by greed, can be extremely exploitative given the opportunity and have now invented a trickle up version of capitalism They have invented systems so that it is not the case of water leaking down a jug but rather a case of a vampire sucking up the blood of the poor until they are snuffed out on homeless street. How does one distinguish a trickle down version of capitalism from the trickle up version? It is not all that difficult really. If the average income of the top one percent or ten percent (depending on choice of criterion) of the population is rising while that of the bottom one or ten percent falls in real terms (adjusted for inflation) then it is the case of a trickle up economy. It happens when the income of those at the top keeps rising while average incomes do not. How can a trickle up economy come about? It is quite simple really when the taxation system, salary structure and printing of currency are in the hands of a few. How does one know if a government is printing more money than necessary? Well is there inflation of more than one or two percent around in your area? If it is then be sure that is what is happening although the guy controller up there called it something exotic like quantitative easing; and if a free floating currency is devaluing with respect to other countries. Taxation: Whenever the issue of raising taxes on rich is considered in any country, arguments emerge that are for and against it. The fact of the matter is that there are times and countries where it is a good idea to do it as well as times and countries where it is detrimental. How does one determine which is which? In order to ascertain if increasing or decreasing taxes of rich is called for one needs to understand trickle-up and trickle-down phenomenon. If it is found that the average income of top five percent in society has been increasing or decreasing over the past seven years (a reasonable time period to rule out temporary fluctuations) at the same rate as the overall average income in society then the tax structure need not be changed. In case the income of top earners is falling at a faster rate than the average then a reduction in taxes of the rich may be called for rather than an increase. However, in case the income of top earners is rising at a rate that is faster than average income then an increase in taxes of the rich seems just, appropriate and useful for overall economic stability of a nation. Welfare: Welfare measures including subsidies that help the poor are directed at the bottom earners of society, the bottom ten percent or at least the bottom five percent. Here too, whenever the question of increasing welfare spending in any country is considered arguments emerge for and against it. Increasing such spending could cause an increase of debt or fiscal deficits and thus hurt the economy in both the short and long term. In order to understand when increasing or decreasing welfare spending is called for one only need to look at the change of income of the bottom five percent over a seven year window and compare it to the change in average income over the same period. Incase the income of the poor (adjusted for inflation of goods that matter to the poor such as food) is decreasing at a rate faster than the overall average there is a desperate need to increase welfare spending. However, if the income of the poor is rising then perhaps a decrease in welfare spending may be considered. If the income of poorer sections of society has been reducing over the past years while that of richer sections rising, this could be because of one of two reasons. Either the poor are becoming stupider and lazier than before while the rich cleverer and more hardworking or, the system is becoming more exploitative of the poor. It does not require more than common sense to realize that the reason for this imbalance can only be the latter. The exploitation and imbalance needs to be addressed on an urgent basis because whereas it may mean choice of home furnishing or size of the home for the rich, it implies the very life and death of poor and their children who are just as sweet as children of others or the choice of which homeless street to sleep on. The quickest way to address this imbalance and injustice is to increase taxes on richer sections of society and then using this revenue to assist the poor. In conclusion, the world does not need communism but it does need justice and a move away from unfair inequalities, because it is the latter that has led to such extreme responses through human history as communism or severing the head of the queen from her torso when she suggested that people could eat cake when they ran out of bread. Since I began blogging seven years ago on Word press and Blogger some of the ideas have caught the fancy of many on far off shores. Encouraged by such responses, this blogger is encouraged now to put forth a new idea that is concerned directly with the health and beauty of our lovely planet. 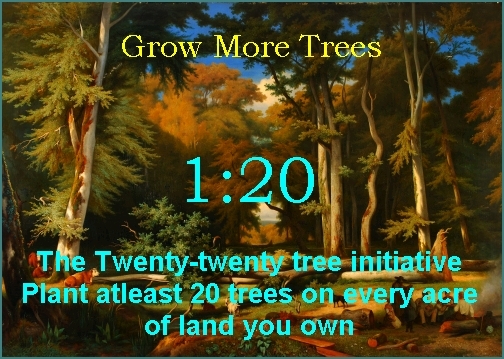 It is called the 1:20 Green earth Initiative here, or one may call it the Twenty-Twenty Tree Initiative. Very simply put the idea is that it may be prescribed by law that every person who possesses or controls land of one acre or more shall ensure that he or she plants a least twenty trees per acre on his land. This law, wherever implemented in a region, province or country would apply to all individual land owners as well as organizations such as farms, homes, schools, universities, industries, trusts etc. if they own or control a piece of land of one acre or more through lease or grant. Actually a far larger number of trees can be planted on an acre of land. This law merely prescribes the minimum. In his home this author presently has more than twenty trees and a home on less than one tenth of an acre and there is a driveway and two lawns besides. Every person or organization that possesses an acre or more of land shall ensure that at least twenty trees of a height of at least ten feet from the ground grow on this land. Those following short of this prescribed minimum shall pay an annual tree deficit tax proportional to the number of trees that are short of twenty. In the first five years after this act is promulgated the height of the counted tree may be less than ten feet. It is not necessary that the trees be distributed evenly on land. Thus a farmer with a ten acre lot can plant an orchard of 200 fruit trees in a corner of his farm to satisfy the requirement. The location of trees and the choice of trees are up to the owner and farmers may prefer timber or fruit trees. In case they wish to harvest the timber at some later stage they may, provided they have planted or otherwise have more than twenty trees to begin with on their land. Some thought has to be given to the appropriate and simple implementation of this law because a law that is not implemented is only a piece of paper. An easy implementation is possible through a voluntary counting and submission of number of trees on their plot in January of every year. They should retain a receipt of this submission because if a surprise random check is made and the submission found to be incorrect there would be a penalty. Half the penalty would be a reward for the person who reports them. Certainly there would be several details of this law that would need to be worked out but that can be done quickly by a group of experts assembled for the purpose, once the idea is accepted. This blogger shall volunteer to be a part of such a group, if necessary, if called to do so by any region within feasible traveling distance. If farm owners may be obliged to reserve a portion of their farms for trees that could well be fruit orchards. One disadvantage of orchards as compared to natural forests is that they are low on bio-diversity and as a result they do not contribute as much to improvements in environment as natural forests. However there is a very simple way to improve both the environment as well as fruit yield from orchards by introducing bio-diversity. If twenty per cent of evenly distributed trees are different from the primary crop in an orchard then both the yield and the environment improves. Such orchards may yield up to one and half times the normal yield over the life of the orchard as per the author’s estimate just because of improved bio diversity and soil health despite the fact that there are fewer trees of the primary crop. In addition there is the joy of a different fruit for the personal consumption and distribution by the owner if not the market. All that has to be ensured is that the other trees are not taller or wider in girth than the primary orchard tree. If some or all of the other 20 percent trees are nitrogen fixing trees the gain is likely to be greater (read this http://permaculturenews.org/2008/09/29/nitrogen-fixing-trees-the-multipurpose-pioneers/). Quite frequently, seeded by animal, bird or breeze a wild tree will come up naturally within an orchard. It is a good idea to leave it in and nurture it as one of the fifth trees. Being natural to the area it will contribute most to bio-diversity. Allowing or introducing wild flowers, berry bushes and mushrooms through the orchard would be even better. The bees will love the flowers and multiply faster. In orchard spaces exceeding ten acres in area do consider a pond with a stream leading to it meandering through the orchard with some fish of an edible variety in it to create the ideal ecology and ground water table as befits our wonderful planet. Trees that can attract bees to nest are an additional bonus for pollination and that occasional jar of honey to brighten up breakfast and the after dinner desert and health of the farmer and his family. It may be mentioned that neither the fruit nor the honey from single source orchards has the same health benefits as that from a bio-diverse source. The same strategy is recommended for palm and olive oil plantations. Farmers into organic farming may label their produce as organic and ‘from a bio-diverse orchard’ for that additional oomph in their marketing. To create such an orchard, just plant every fifth tree in a row of a different fruit or timber. In an existing orchard selected trees may be removed to be replaced by others and when a forest is cleared for a plantation just leave in some original trees so that in the end one fifth the trees are the original ones. While the twenty-twenty tree initiative prescribes minimum growth of trees on large plots of land, the Tweety amendment is the suggested amendment for small plots that are smaller than one acre. Here a minimum requirement of one tree for every two hundred square yards of land may be prescribed under the same initiative with similar fines for not growing them. Thus a person owning 800 square yards of land in an urban, suburban or rural area would be required to grow at least four trees on it that are taller than ten feet in height. Tweety amendment is just the name given here. One can easily choose another if one wishes but it will certainly get tweety birds singing to home owners every morning. This scheme requires imposition by a government and in democracies an essential requirement is that a scheme be popular over the short term as well, not just the long term. A new tax of any kind on farmers will not be popular on farmers especially in India. In this case the scheme can easily be inverted by converting the tax to a financial reward based on trees. it would become highly popular then. The funding for it can come from other tree plantation budgets of the country. Spent this way it would be far more productive than other plantation drives since individual care and responsibility by citizens is ensured. Q: I own 1.359 acres of suburban land. If this initiative becomes law in my area, how many trees will I be required to plant? Q: I own a ten acre farm. In case this law comes into force I would hate to shade my farm. Can I just choose small lime and lemon trees and crowd them in a corner of the farm? Q: I own a commercial plot of 200 square yards in the marketplace and have constructed all of it for my shop. It is permitted in commercial areas of my city. I really have no space for any tree. What should I do? Ans: If your business is making good money you do not have to do anything, just pay the annual tax for a single tree deficit. If your business is not doing well and you cannot afford to pay even that tax, then pull down the business premises and grow fruit trees on it instead. You will at least get to eat the fruit. Q: I have a small urban dwelling on 330 square yards and I have paved the entire front portion. What shall I do? Ans: All you need to do is break a two feet circle in it, pull out the rubble, replace with good soil and compost and plant a tree in it. Your home will look prettier.